We use present day observations to infer past events every day. I look out and see the patio is wet and a large dark cloud has just passed overhead. From this I derive a very reasonable hypothesis despite not being an eyewitness to the history: my wet patio was caused by a rain shower. I might be wrong, maybe the kids had a water hose out and sprayed down the patio moments before I looked out the window. But I can test that hypothesis. And I don’t have to go back in time to replay history to test it, I can test it by asking what I would expect to find if my patio had been watered by a hose? There should be evidence the hose had been in use, my kids must have been in the yard, etc.. Finding out that none of my expectations are met, my confidence in my first hypothesis, that rain caused my patio to get wet, grows. Now I look up in the trees and see that they are also wet and I become confident beyond reasonable doubt that I know the true history of events leading to my patio appearing as it does in the present. 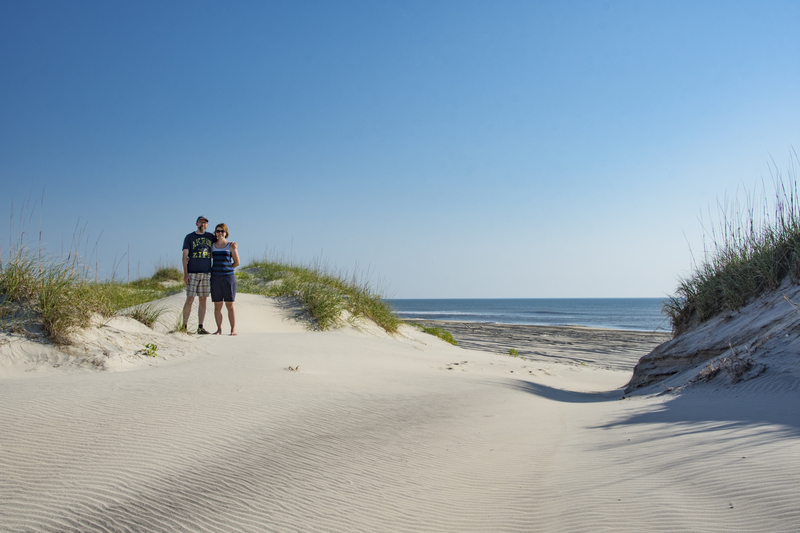 I just returned from a family vacation to the North Carolina Outer Banks. While hiking among some sand dunes early one morning I tracked a number of sets of footprints. 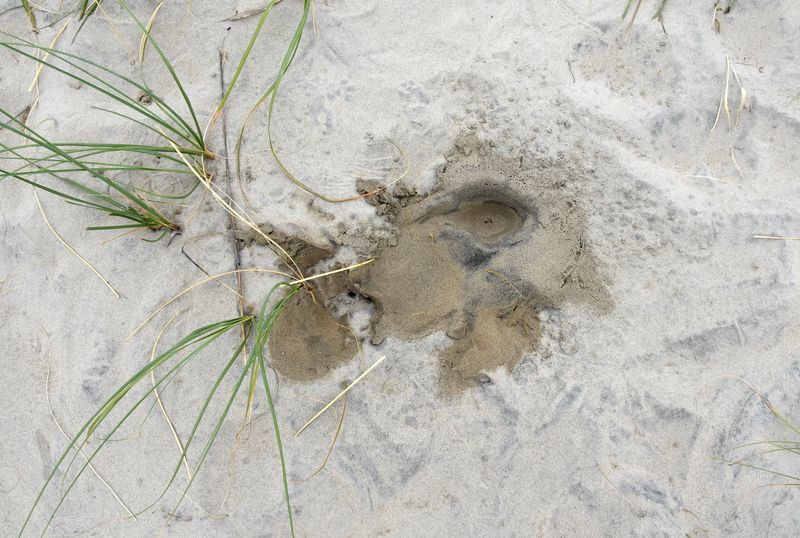 Most were of birds and crabs, but I also found a number of footprints of grey foxes and horses. In each case I never saw the creator of the footprints but I am confident I have properly interpreted the origin of the footprints. Footprints are a good example of how we can make observations of and combine them with knowledge – other observations – of their origin to infer the presence of animals at a location in the past that we have never seen. I did see grey foxes at another location but I didn’t see any horses this year. But I’m quite confident that these animals exist and that were at the same location I walked no more than 12 hours earlier? Why? Because it rained no long before and these footprints were made in the wet sand. Here again I have made another inference from present day observations. 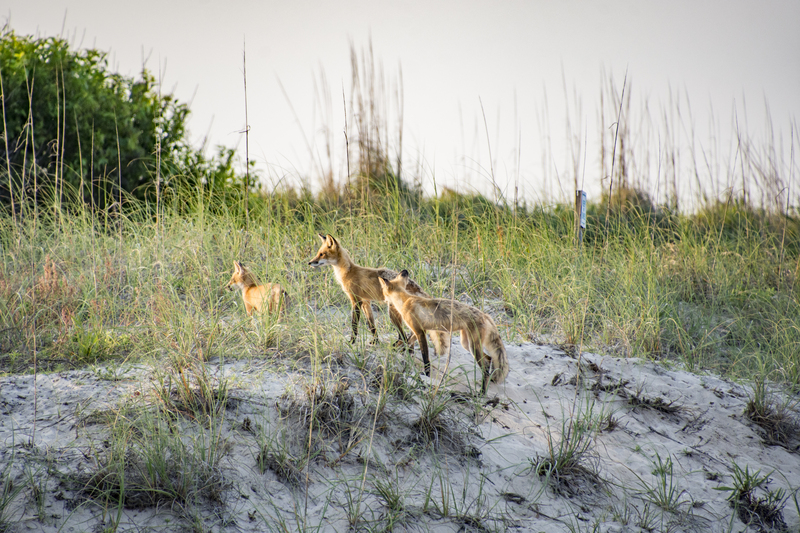 I have directly witnessed foxes stepping on dry sand and wet sand and have made observations of what those prints look like so when I saw the prints on the hike I had a good idea under what conditions they were made. Here are some other examples I noted of how we use clues found in the present to infer past events. Those clues are our witnesses of past events. We can make mistakes in how we interpret history but that isn’t to say that we can’t be quite confident at times in the truthfulness of our interpretations. Ironically, human eye-witness testimony of historical events is often fraught with more errors than circumstantial evidence. Here are a few other examples from my recent vacation. During a hike with one of my daughters we came across many sets of horse footprints. It was easy to infer a horse had walked where we were but when? In some cases there were piles of horse manure along the trail. Some of that manure was dried out and partially decayed or covered with sand. But other manure was moist, dark and had no sand on it. The latter is strong evidence that points to its being much more recently deposited. What could make us more confident that a horse had recently visited these locations? If we found additional evidence that supported our hypothesis. And we did find that additional evidence. Below is a picture of some of the evidence that convinced us that at least one horse had been at our location not long before we arrived. A large animal seems to have urinated here and not long ago since the sand was still moist and the surrounding sand is dry. I don’t have a scale marker on the image but this is a lot of wet sand. There were abundant horse tracks and no human tracks at all three locations that we witnessed wet sand. You might have an alternative history for his wet sand. You might hypothesis that it is the result of a human urinating on the sand. Well, we can test that hypothesis as well and we don’t need any surveillance video to do so. We could have several people with full bladders urinate on the sand and see if any of them could produce this much wet sand. I’m fairly certain the answer would be no. But there is more evidence we can bring to bear on this hypothesis. There were no human footprints anywhere near this wet sand. Did the person who is hypothesized to have urinated here seek to hide their involvement by carefully sweeping away their tracks? Even had they attempted to do so the slight crust of dry sand due to the rain the night before would have made it extremely difficult to hide ones footprints. If one still insisted that it is possible that his is human urine and not horses, we could take a sample and do a chemical analysis. Now, if you are simply convinced your hypothesis is true and the sample analysis comes back as horse urine you could still claim that there is a conspiracy to hide the truth and that the urine samples were swapped or the data faked. To reject the “truth” in this case seems a bit silly. The evidence pointing to the presence of horse at this location in the past is very compelling. This isn’t a matter of having the right viewpoint and then making the data fit the facts, the facts themselves point to a single compelling truth. But let’s come back to this point after looking at one more simple example. I saw a dead bug lying on the sand. Leading up to that bug was set of tracks that I would follow many yards beyond the contents of this photo. On the photos I have indicated the direction the tracks lead with arrows. From my observations I concluded that the bug that I observed lying dead on the sandy surface had made the tracks I observed. It is not difficult to interpret the evidence from these tracks. They tell me the places the bug had been in the minutes leading to its death. I don’t know exactly how long ago these events happened in the past but I would hypothesize that it wasn’t more than a few hours before we showed up because a dead bug lying on an exposed surface isn’t going to last very long with as many birds wandering around looking for a good meal. I doubt that anyone would dispute my conclusions about the histories that I have inferred from my observations made in the present. We all make similar inferences every day about past events using our common experiences in the present and our powers of deduction. The evidence is compelling. 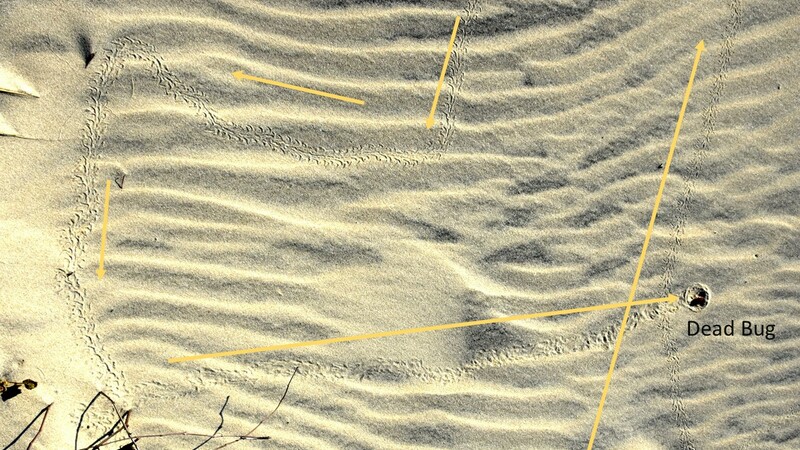 Multiple convergent lines of evidence direct us to one most reasonable solution: in the first case, a horse passed through this sand dune in the not too distant past. We did not see the horse ourselves and yet my daughter and I were confident that such an event did happen. Can we make similar inferences about events that happened thousands or millions of years ago? Absolutely! In some cases we may not be able to come to such specific conclusions but we can certainly be confident that events occurred and conclude how they may have come about. In many cases we can also determine how long ago those events took place. When geologists look at a geological feature like the Grand Canyon they feel they are reading history in much the same way each of us does every day though their tools may be more sophisticated and require a greater amount of expertise to employ them. Like the evidence that points to horses having visited the sand dunes, the conclusion of great age involving a protracted series of discreet events to create the Grand Canyon is obvious because multiple convergent lines of evidence point us directly to that conclusion. Some particulars of the history of the Grand Canyons may not be as self-evident as the tracks of a wild horse but the general history of great age is equally as convincing. The Toba Super Eruption: A Non-Flood Catastrophe – The Artifacts Say Yes! Juvenile Dinosaurs Found Huddling In A Nest: Testimony to a Global or Local Catastrophe? Carol Cleland at University of Colorado Boulder has written some very interesting stuff about the similarities and differences between laboratory science (often taken as the gold standard, because of repeatable experiments) and historical science. Recently (abstract here: http://specialpapers.gsapubs.org/content/502/1.abstract ) she has argued that it is historical science that has the edge; what happened, happened and left its mark, even if we can’t as yet explain how. Hi Paul, great minds here! I have all her papers and I make many students read them as part of their written comprehensive exam preparation. I have linked to her papers a couple times in previous posts about historical science. I could have used Cleland’s “smoking gun” reference in this article. Maybe I’ll edit that in there where I talk about convergent lines of evidence. Very good stuff here. I regularly try to get my kids to figure out how to make inferences based on evidence. For example, we recently found some rabbit droppings in our yard, and my 5-year-old was able to conclude that a rabbit must have sat there. The same goes for footprints, fallen leaves, branches, etc. I explicitly point out that we can know these things even though we didn’t see them happen ourselves. Your “gray” fox looks like a red fox to me. Your distinction between “inference” science and lab science, reminds me of Einstein’s challenge by a few fellow scientists in Germany. They argued that his theoretical science (relativity) was not real science because it was not lab science. Even though there was confirmation by a measurement of the amount light was bent as it passed by the sun. I’ve explored in my blogs modern day equivalents of these: (1) discovery of gravity waves (inference science) versus (2) discovery of the Higgs-boson (lab science)…. Google on my full name IanDexterPalmer, then do a quick search. Also, if you haven’t watched it, you would enjoy the tremendous series called Genius (about Einstein’s life and work) on Nat Geo. Its just finished, but hopefully can be streamed in. Yeah, I thought they were red foxes as well. Several had older grey hair they were shedding. I expect they will get more grey over the season. I looked them up to be sure that the population was grey foxes and I read several descriptions of why they are grey foxes. I’ve been meaning to check that series out. I have seen your blog before but hadn’t seen those articles. Good stuff. First, I’m thinking about the guy who will say this about the blogs of the 21st century, 2000 years down the road. So lets say somebody comes up to me and says “Sorry bud, you were actually born in Africa.” I would need a lot of proof not to believe the testimony of my Dad and Mom. I should treat the Scriptures on an even more trustworthy level than my parents. Discussion is difficult when those arguing have very different prior assessments of probabilities. You assume on reasonable circumstantial evidence that your mother will tell you the truth about where you were born. This makes sense all round. However, your view is at lease revisable. You might discover from historical records that your mother had good reason for lying, e.g. to establish right of abode, and if it then turned out that your birth had actually been registered in Africa and not where she said, you would have to conclude that she had done just that. You also assume that what the Bible says is true. I don’t know why you assume this. The only argument you give for your belief is a statement in the Bible itself, immediately begging the question. But as long as you are irrevocably convinced (a) that what the Bible says is true and (b) that the Bible means what it says when it refers to a world-wide flood, then even showing you the continuous Egyptian historical record spanning the proposed date of that flood will not shake your belief, and will merely force you to conclude that the Egyptologists are mistaken about their timescale. Geologists and biologists likewise, of course.